Equally true is the fact that this assault on the biblical worldview and the authority of God’s Word is nothing new but finds its origin all the way back to Genesis 3 (“Did God really say . . . ?”). What is original is the way in which the enemy is using that same Genesis 3 attack today. And in our day and age he has attacked biblical authority by attacking the Bible’s history with evolution, ape-men, the big bang, millions of years, and so on! All the while implying that if you cannot trust what the Bible says about history, why should you trust what it says about salvation! The consequences of this covert attack have been devastating and are well documented (see Ken Ham’s books The Lie: Evolution , Why Won’t They Listen?, and Already Gone). As a result, in recent generations there has been a foundational shift away from God’s Word as the authority with much of the fruit of this change only now becoming visible. So to many of us it seems as if the culture has changed overnight, but in truth the enemy has been sowing these seeds of destruction for quite some time. Bottom line, we now live in a different culture, a secular culture, a culture where many refuse to believe the gospel because they don’t believe the book from which the gospel comes. This is who we are dealing with. How do we approach this sort of culture with the gospel? 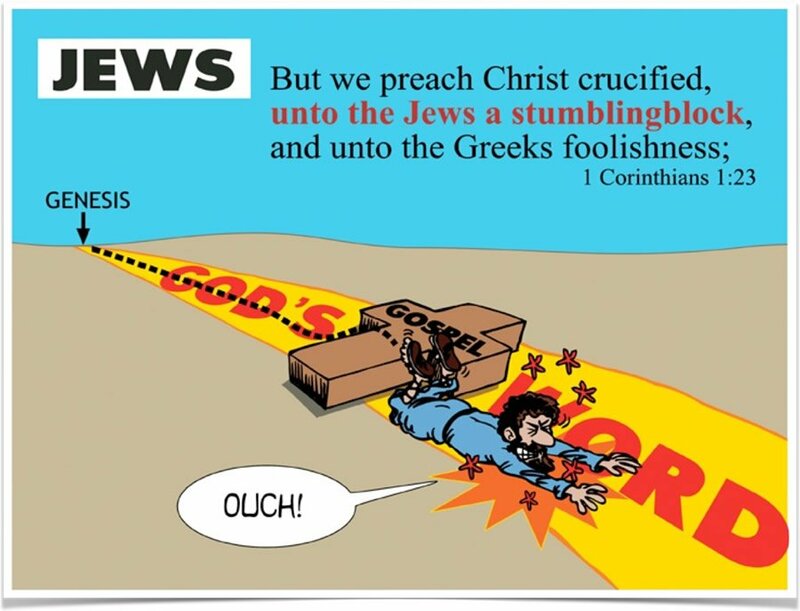 Why was the gospel a “stumbling block” to the Jews and “foolishness” to the Greeks? Why the difference? And how does this relate to sharing the gospel with a secular culture? To answer these questions, let’s quickly look at two sermons in Act 2 and 17 and then correlate the principles we see to our current cultural situation. In Acts 2, the Apostle Peter is preaching on the day of Pentecost. If I may paraphrase, Peter basically says, you crucified the Son of God, but God has raised Him from the dead ( Acts 2:23–24 ). After hearing this, the people were cut to the heart and asked, “What shall we do?” Peter replied that they should repent and be saved, and as result around 3,000 people gave their lives to Christ ( Acts 2:37–41 )! Acknowledging upfront that God is the author of salvation ( Ephesians 2:1–9 ), why, from a human perspective, was Peter so successful? Well, Peter was speaking mainly to Jews. At that time in their history, they believed in the biblical God and the history in Genesis. They believed in Adam and Eve, original sin, death as a consequence, and so on. So when Peter used words like God and sin, they understood what he was saying because they already had the proper biblical foundation to correctly understand those terms. Having the right history and foundation put them on the right road that led to the gospel, but their “stumbling block” was the message of the Cross. If we think about it, years ago in the 40s, 50s, and early 60s, America was very much like the Acts 2 culture Peter was preaching to. We were a very “Christianized” culture, much more biblically literate than we are today. Back then we had prayer and bible study in schools, and families were more involved in the church, which played a more prominent role in societal life. Overall, we had a biblical foundation to much of our cultural thinking, so someone like Billy Graham could come in and give a straightforward presentation of the gospel like Peter did, and get a big response like in Acts 2. But today we really don’t see responses to the gospel like we did in Billy Graham’s day. Why not? This is the key, we are no longer an Acts 2 culture—we are now an Acts 17 culture. To find out what this means, keep an eye out for the final blog post in this series, which will be published within the next two weeks! Until then.